When reading about Rivage Atlantique I found the name a bit off-putting. This new restaurant is located in the Olde Worthington Quarter in the former location of a few failed restaurants. I see no signs of Rivage failing. I also see a loyal following developing already. I did a walk through of Rivage one Saturday during the Old Worthington Farmers Market. I was instantly impressed. I asked a guy dressed in very casual clothes for a printed look at their fare and he gave me copies of the various menus. He also introduced himself as Rich and started talking about what Rivage wants do and serve. Considering I was unshowered, a little sweaty and donning my cool (?) cowboy hat, the extra service was unexpected. At the time I did not know Rich was the executive chef. Parking at Rivage can be a little tight considering The Quarter also sees people flooding in to House Wine, Graeter’s, Worthington Inn and other places. There is plenty of public parking a short walk away so get a bit for pre-meal exercise with a stroll. Rivage is divided into two sections. The main dining area seats about sixty or so. The back room, which has its own entrance, houses the Gastropub featuring a not so traditional bar menu as well as the option to order off the menu from the front of the house as well. The Gastropub has a large variety of craft beers on tab as well as bottles. The wine selection has depth as well. The pub side has multiple TV’s set up for the sports crowd and an eclectic mix of music for the rest of us. The Gastropub menu is more than a back room assortment of bar snacks. This menu easily stands on its own. Selections include an oyster raw bar, bisque and chowder, more oysters, shrimp, clams, low country crab dip, trout pate, Applewood smoked pimento cheese dip and more. Portions are generous and well prepared. The restaurant uses a stone hearth oven for a variety of pizzas including White Lobster Pie (lobster, basil, ricotta and olive oil) and the Butchershop (Italian sausage, pepperoni, salami, provolone and whole milk mozzarella with thick house made sauce). The Cuban Sliders would get a thumbs up from residents of Miami. The bread is pressed in the grill just right to compliment the spiced pork loin (some meats are smoked in-house), ham, house-made spicy mustard, onion and swiss cheese. There are twenty items on the Gastropub menu which offers more than enough depth for a meal or a snack. The menu in the front of the house deserves a mention as well. It is very seafood focused with half of the two page menu involving a variety of fish, scallops, shrimp, mussels and more. 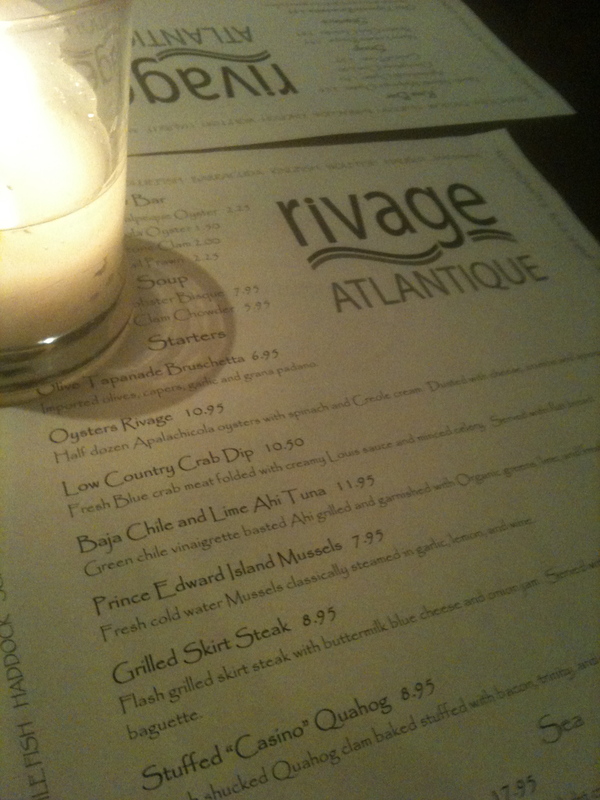 Rivage is a worthy port of call when visiting Olde Worthington. This entry was posted on June 8, 2011 at 6:31 AM	and is filed under bar, restaurants. Tagged: Rivage, Rivage Atlantique. You can follow any responses to this entry through the RSS 2.0 feed. You can leave a response, or trackback from your own site. Nice review Jim. This place escaped my notice until now. Too bad they are not open for lunch, but maybe I’ll try a brunch (assuming I can find a place to park).